On the corner of 600 south and 500 west in Salt Lake City there is an nondescript brown building, It doesn’t draw the eye in any way whatsoever and you wouldn’t be blamed for missing it even if you were looking. Step past the windowless entrance, however, and things change dramatically. Your eyes quickly adjust to the light and immediately you start taking in a variety of sensory inputs that don’t square with the drab brick exterior you just left. Colorful international flags hang from dark exposed rafters, a distinct yet subtle perfume of “old truck” fills the air as a stark red mount of dirt with fills your line of sight. On it, a two-tone green over white wagon, it’s a Land Cruiser FJ55, a personal favorite of mine. Looking just behind it reveals long rows of other beautiful Land Cruiser, beautifully displayed, part of a collection of nearly 100. The Museum’s owner and founder, a Land Cruiser fanatic by the name of Greg Miller, tells me there are still about 40 to go before he’s got the entire set (before they make another one). It’s 20,000 square feet but it still feels jam packed, yet more than the sheer number what strikes you most is the diversity, from rock crawlers to fire trucks, race vehicles to rare early production vehicle. Its amazing to think that such a collection could all be contained by one model name. It could only happen with the Land Cruiser name which is the longest continuous running car model in the world having been first put into use in 1955. The Land Cruiser name is well respected and loved the world over by enthusiast, governments, industry and explorers alike. More than that, it’s the name that really put Toyota on the map as a reliable and respected brand especially outside of the domestic market, so you can imagine Greg’s surprise when he went to Toyota City in Japan and found that there was not only no Land Cruiser Museum…there wasn’t even a single Land Cruiser in all the official museums. He decided that needed to change, and as soon as he was done with a years long expedition to drive the same Land Cruiser on every continent on earth...he set out doing just that. The VDJ78 that accomplished this singular feat is here in the collection and it’s amazing, but its Greg’s latest addition I’m really here to see. In the late 80’s and 90’s Japan’s car industry was riding high in the throws of its bubble period - Big ideas, seemingly endless resources...anything was possible, and it really was a high point for Toyota and the Land Cruiser. The 80 series Land Cruiser, introduced in 1990, was extremely well engineered and received and is generally considered, even today, as made in Toyota’s finest hour. It also brought us the Mark IV (A80) Supra, and SW20 MR2 among other greats, yes things were right at Toyota and it was in this environment the BXD program was created. The goal of the program was two fold, both of which seemed more “why not” than anything else. 1.To provide the Japanese Self-Defense Force with a domestically produced military vehicle as well as (hopefully) sell it for export. 2. Explore the idea of what a Land Cruiser could be. This resulted in the BXD10 and BXD20, the 10 being the military version and the 20 being the civilian version. The easiest way to describe a Mega Cruiser...well you’ve seen a Hummer right? That, but made by Toyota. Uh, huh...Anyway, here is a comparison of the two on paper. There are other similarities as well, including 4 wheel independent suspension, portal axles, etc. Yup, totally different. However to call it just a rip off Hummer is to do it a disservice, because as similar as they were, there were some unique differences. One way they were vastly different was in build numbers, while hundreds of thousands of military and civilian hummers were made over its long run, BXD numbers are a bit more, well, modest. The numbers are a little uncertain with the BXD10 but most place it in the 1000-2000 range. The BXD20 however is even rarer, with only 149 being produced from 1996 to 2002. This particular Mega Cruiser is a 1996, the first year of production which was also the busiest with all of 82 being built. To help you make sense of that number, the Lamborghini LM-002, the 3rd member of the holy trinity of crazy 90’s off road wagons, had 328 examples made over nearly the same period. Hell, Toyota even made more 2000 GT at 331 examples, making this one of the rarest of all “mass produced” Toyotas ever. The Museum’s curator assures me that this BXD20 is likely the only one in the America’s...as in this hemisphere. 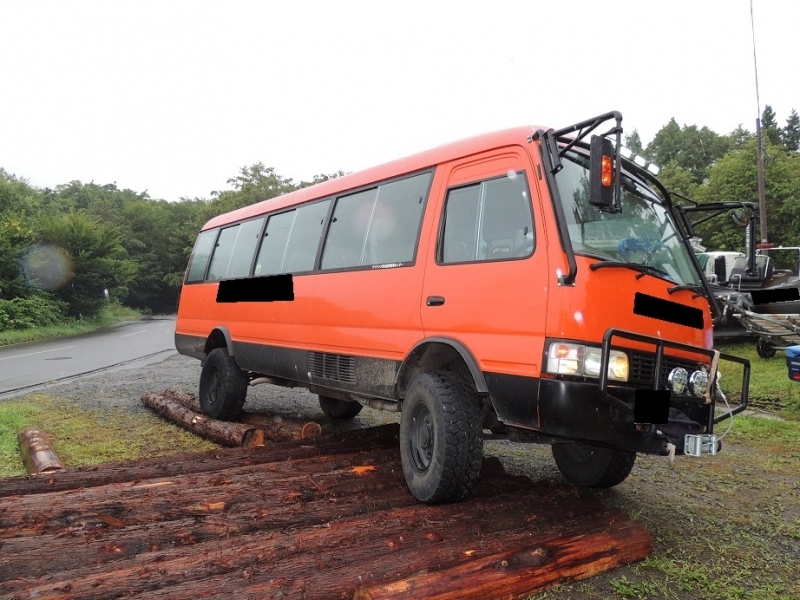 Its rareness extends past the build number as well as the Mega Cruiser, like the LM-002 has unique tires. It’s 37x12.5R17.5LT Bridgestone Mud Duelers are bespoke to the BXD. Only one tire was made in this size and it only fits this vehicle. The 17.5 diameter rim size, somewhat common on heavy trucks, was made to accommodate run flat tires which bridgestone was just starting to really develop and advance. Those tires, In addition to being able to stay viable when shot, could also be inflated and deflated to suit terrain. An onboard compressor and tank would allow the user to select either 1 bar (14.5 psi) or 2.2 bar (32 psi) from a rocker switch on the dash which was fed to each wheel via a special fitting behind the rim. That engine is the 15B-FT, which is an iron block with an iron 16 valve OHV head, the cam is driven by timing gears, its turbocharged and intercooled and a features a purely mechanical direct injection system. Basically, it’s a blueprint for how to make an indestructible engine. Fast? No. This version produces about 148 hp @3400 rpm. The later versions got the 15B-FTE which gained electronically controlled injection and was rated at whopping 153 hp@ 3200 rpm and 282 lbs-ft @...everywhere. The 15B-FTE engine was the “screamer” of the range. *Claimed top speed is 81 mph. I wasn’t allowed to verify this with a drive, partly on account of it being so new it hadn’t been appraised for insurance yet and partly because I’m just some guy who likes land cruisers, but I have been offered a drive in a military version as soon as it makes its way from the importer back east to Utah so I will have to update you when it happens. The transmission was the venerable A443F, an Aisin built transmission Land Cruiser aficionados affectionately call “the bus transmission” for its robustness and because it was used in actual coaster busses (including a 4wd version called bb58 that shares a lot of the Mega Cruiser drivetrain, including front portal axles). Its a 4 speed fully mechanical automatic transmission similar to a GM Turbo 400. Tough and dumb. The 4WD system is a purely mechanical full time 4wd system with user selectable locking front, rear and center differentials tackles the traction problem the old fashioned way, with brute force. Like the Hummer the brakes are inboard at the differential, from there the power is carried via beefy CV’s going to the 1.662:1 reduction portal boxes and then finally to the wheels. It’s simple, strong and purely mechanical. Suspension is double A arm with torsion bar type springs front and rear. The shocks are mounted high and tight to prevent damage. The arms look dainty but they are all thick, cast pieces that would take some work to hurt. The more I crawl in, around and under it the more I realize how practical, simple and rugged the engineering is. It’s not flashy or high tech, in fact there is a good chance there isn’t a single computer on this entire truck and the only electronics I could find were simple devices like the E-locker controller and switches. It’s got a very last man standing/Omega man vibe to in the same way old Military K5’s do. You would think this would translate to a horrible interior, bereft of comfort but its not that at all. It’s not nice by any means but its simple, clean purposeful and doesn’t hinder the experience in any way. A liberal use of the Toyota parts bin is evidence that this was never meant to be as fully produced as the more traditional Land Cruisers. The HVAC controls are from 60 and even 40 series Land Cruisers, the shifter and most of the buttons on the dash including the central differential lock and rotary selector dial for the front and rear lockers are the same part numbers in my Land Cruiser. The window switches, clearly an afterthought for the civilian version, are lifted straight from the 80 series including the radius cut from where they fit in the armrest. The dash is minimalist and has a commercial box van look to it with only the bare essential gauges - Nothing more than you need. The seat material is that airport lounge/ferry/bus stuff from the 90s in a light blue hue. Luxurious it is not which, a fact which would be no balm of comfort if you bought one new in 1996 for the equivalent of $186,000 in today’s dollars. Yes, bubble era indeed. It’s a snug fit up front but not bad, and certainly not claustrophobic. It has great sight lines and unlike the hummer doesn’t feel like a rolling pillbox, owing from its extra height which was put into taller glass. It feels every bit expansive as it appears from the outside, with a dash panel that seems to stretch on forever, a trick of both its lack of features to visually break up the expanse as well as there actually being over 7 feet of it. The Windshield is massive, nearly as wide as a Hummer but taller and single piece, not two piece like the Hummer. Finding a replacement would be...tricky. To keep that acreage clear it had 3 front wipers, way before it was cool with the FJ Cruiser. It also had 2 rear wipers and while it wasn’t the first Toyota with that feature (Cressida wagon) I think I can safely say this is the only Toyota with 5 wiper blades. Could this be the record holder for most main glass wiper blades on a production vehicle? Prove me wrong! To the immediate left of the driver is the transmission tunnel and hump. The way the frame works on the mega cruiser is that it has a narrow backbone style boxed frame central and the body drapes around it. It’s up high, right at the drivers hips, and the entire drivetrain sits on top of or inside that backbone. It’s a little strange to think you are outside and in the middle of the frame, but you get used to it. From the driver’s seats it’s actually not in a terrible place and most of the ergonomics on this truck are better than a Hummer and light-years ahead of the Lambo. I will say though that being in the front passenger seat wouldn’t be much fun on long trips as the footwell is cramped and there is literally nothing but a single HVAC vent to keep you distracted as you struggle to talk to your driver over what I could only assume would be a roar of tire and engine noise. Load up on books and movies before you set off. The rear seating arrangement is particularly interesting with outboard buckets that feel time zones apart and in between a bench seat for 2 more. Bench seats or buckets...why not both? I’m 5'9 and I can lie comfortable across the bench with the doors closed and still just touch the door above my head if i reach. The people in the buckets get plastic grab handles on the backs of the front seats, but the bench seat passengers are treated to a thick steel grab loop that looks straight out of an amusement park and you half expect it to hydraulically lower over your lap in lieu of seatbelts the first time its presented to you. That vastness pays dividends though: its width and additional foot in length over a Hummer means the inside is cavernous with huge volume in the cargo area. At 55x81 inches you could fit a double bed in the back with plenty of room to spare or a queen bed without much trouble and still seat 6. Headroom is excellent, partly because the steel roof still features a prominent bulge for what I can only assume was a gunners turret, here converted haphazardly into a manually opening moonroof. The roof is oddly two tiered as well, rounded over the passengers and completely flat over the cargo area, with a strange seperation you can see from inside suggesting its 2 pieces. One fun and final way Mega Cruiser differentiates itself from its American counterpart is with rear steer as standard. Where the Hummer has an astounding for its size turning circle of 25.5 feet, the Mega Cruiser could literally run circles around it at 18.4 feet, or about the same as a Jeep Renegade Trailhawk. Given that Mega Cruiser is 7 feet wide thats a no mean feat. The way it accomplishes it also also noteworthy in its simplicity, as keeping with the theme it features no electronics save for a single input from the speed sensor to lock out the system above 5 mph. Below 5 mph it turns the rear wheels out of phase to the fronts and according to all who’ve experienced it it makes the big beast feel much smaller around town and on the trail. All in all it’s a truly fascinating machine and ever since writing about it years ago I’ve been eager to see one and see if it lives up to the hype, and you know what? It does! I suppose much of that could be coming from a strong Land Cruiser slant as on paper it does seem to shake out versus a much more common Hummer but then again there is something different about it that I can’t put my finger on that makes me really love it. The hummer announces itself loudly wherever it goes and while that’s certainly part of the appeal, something about the Mega Cruiser doesn’t and its refreshing. I don’t know if its the design, the engineering or something else entirely that gives it a very different character. It doesn’t feel like its spoiling for a fight the way the hummer does. If the Hummer is the Chuck Norris of trucks, the Mega Cruiser is Bruce Lee. In the end it wasn’t meant to be, but the good news is that thanks to Greg and his awesome team at the Land Cruiser Heritage Museum it’s now possible to experience in some small part what might have been. Another ray of hope? Greg tells me these aren’t meant to be garage queens and that sometime soon he plans to load up one of his early model land cruisers on a trailer and tow it down to Moab with the Mega Cruiser.